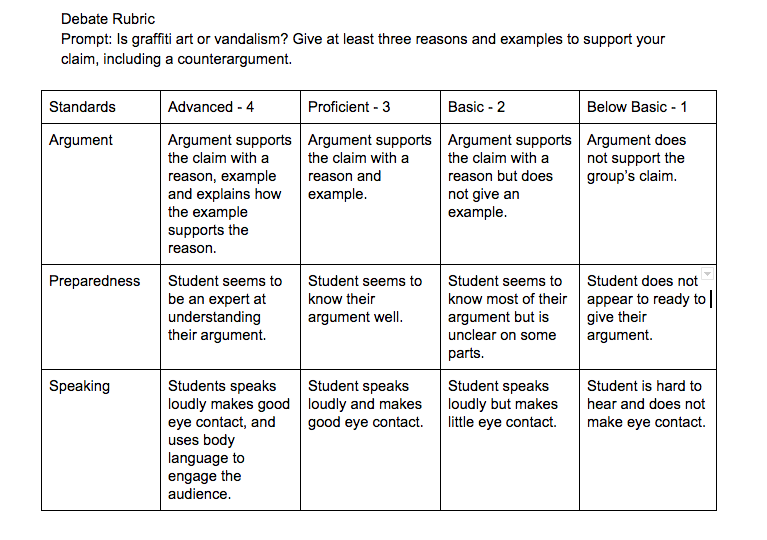 Content Objective: I will be able to engage in a collaborative discussion on graffiti by working in a group to brainstorm at least five reasons to support my claim and completing the exit slip. Language Objective: I will be able to explain what makes a reliable source. ​Homework: Be creative - Without your family's permission, someone has tagged your house with a beautiful mural. What would you say to the artist and why? Do Now: Quickwrite - What are the features that make a good debate? 1. Click here to find out which debate team you will be on. 1. To have a debate, you must be prepared. Working with your group, brainstorm ideas to help support your claim, "Is graffiti art or vandalism?" 2. In order to come up with ideas, you may look back at the four articles on Actively Learn, you may use your essay research, you may look at the video we watched (Bomb It! ), or you can research other articles or websites for information. 3. Question - What makes a reliable source or website? At least five reasons and examples that support your claim. 5-10 visual examples to support your reasons that can be shown during your debate. Exit Slip: Let Mr. Westrup know what your five reasons are to support your claim. Click here to fill out the Exit Slip.